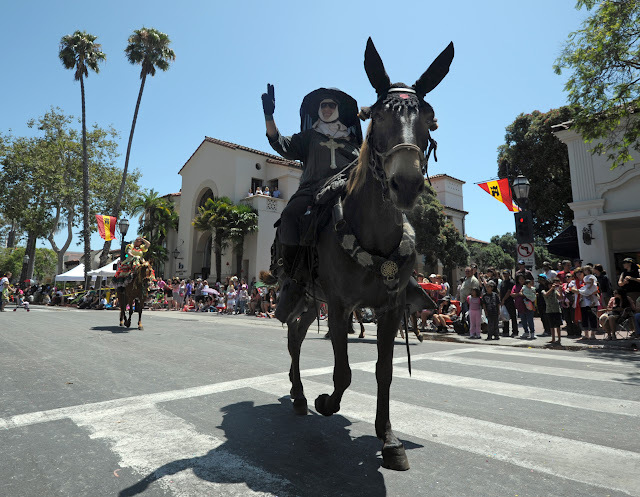 A ride that was the fulfillment of a great ambition, a first for Tobe and I, riding in the magnificent El Desfile Historico, the Santa Barbara Old Spanish Days Fiesta Parade. 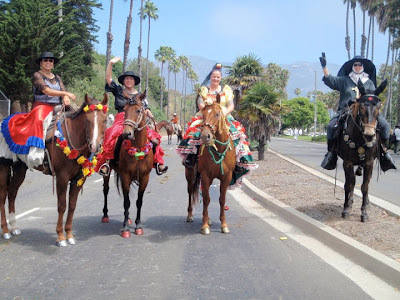 I have been watching this parade every year since moving to town in 1975, and I have even ridden on floats three times, but this was the first time I could take part as an equestrian! 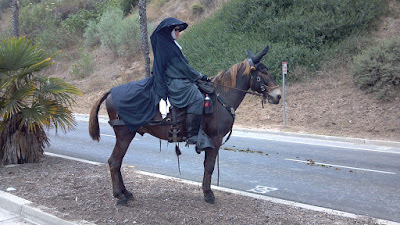 Of course I do have a Fiesta dress, obligatory ruffles, but my achieved ambition was to ride as a NUN. In my riding habit! I figure, in the Spanish heyday the best educated women were the religious, and they rode mules because of their smooth and steady reliability. 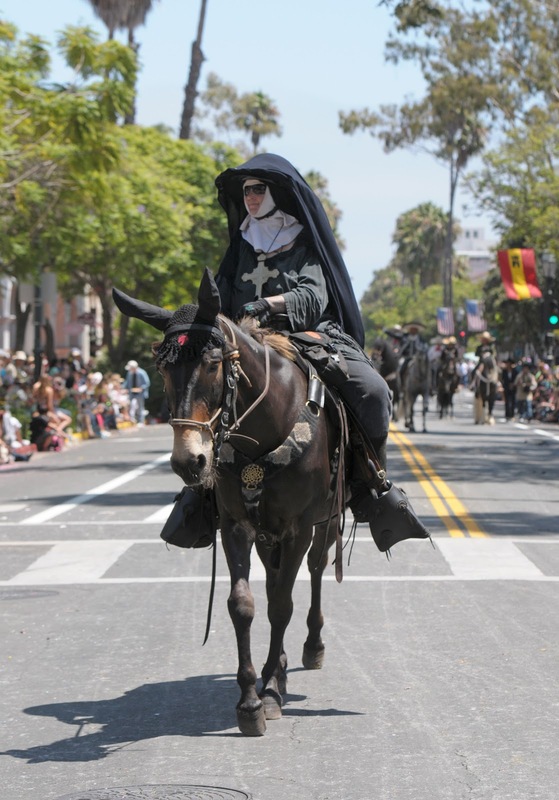 Also since Father Virgil's death I don't think the church has been much represented in the parade, and certainly I don't think there was EVER a nun in it before now! It is a seriously scary ride. There are usually injuries, thankfully this year none were serious. I saw a Sheriff's mounted patrol horse go down under his owner while we were all hanging around at the beach, it threw the rider to the asphalt and then acted like it was having a seizure. In the parade a carriage flipped over, ejecting a local politician. Knowing that at any moment something like this could happen had me on heightened alert the whole time. But Tobe and I, we were safe and sane. I blessed the crowd all the way, some crossed themselves back, some flashed me a peace sign, maybe misinterpreting my Pope salute. It was all fine. Difficulty: Scary! Walking on the city street, surrounded by mariachi bands and Vaqueros with their prancing stallions, people running out from the sidelines to cross the street, distractions and loud noises and commotion everywhere.... no problem for the Mighty Mule and I! Here we are waiting on Cabrillo Blvd. We were way at the back of the parade so once we lined up we visited with other riders, Tobe ate some lawn grass at the harbor parking lot, and we stood on the median to rest his hooves. I gave the Pope-style blessing to everyone along the route. It certainly freed me from having to shout "Viva La!" like the other riders were...... we could be just a bit more stately and controlled. I put ear covers on Tobe just to make him that much more regal, accentuate the positive, like a Medieval War Mule on his way to the Holy Land. 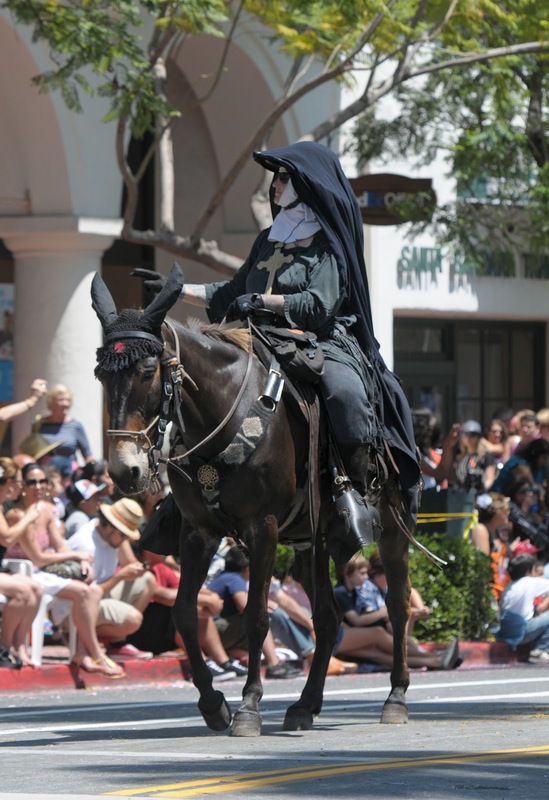 Funny thing, not only was I the only nun in the parade but I wager I was the only person wearing a helmet. I used my usual helmet with shade brim and added a veil for effect. Tobe is just doin' his job. From the trails to the streets, from the mountains to the sea, the mule is the only mount for me! And always fun to travel in good company! The Fabulous Fiesta Foursome!